Almost every new day brings new entertainment from the renewable energy crowd. 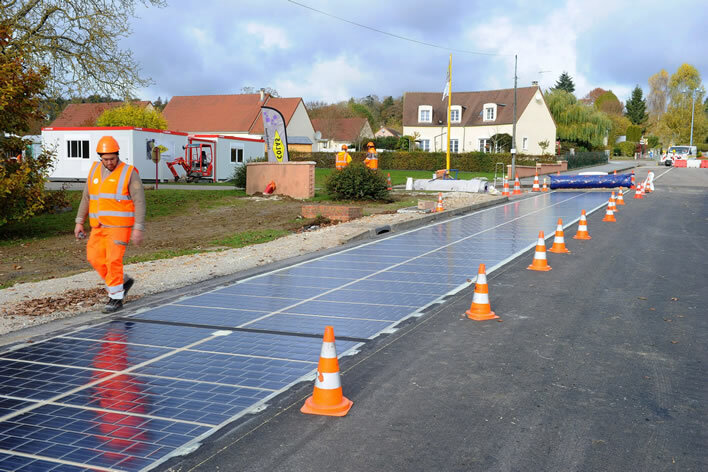 Yesterday's feature was the news that a construction company has completed a 1 km stretch of regional road near Tourouvre-au-Perche in Normandy (c. 3,000 inhabitants) that has a surface made up of solar panels. It's called project 'Wattway'. In a sane world, an employee who suggests to the CEO of a construction company that they should surface one side (2.8 m wide) of 1 km of a road with solar panels would be sent off for a mental health review. Under French labour laws you can't fire these people out of hand so they have to be promoted out of harm's way or become local politicians. 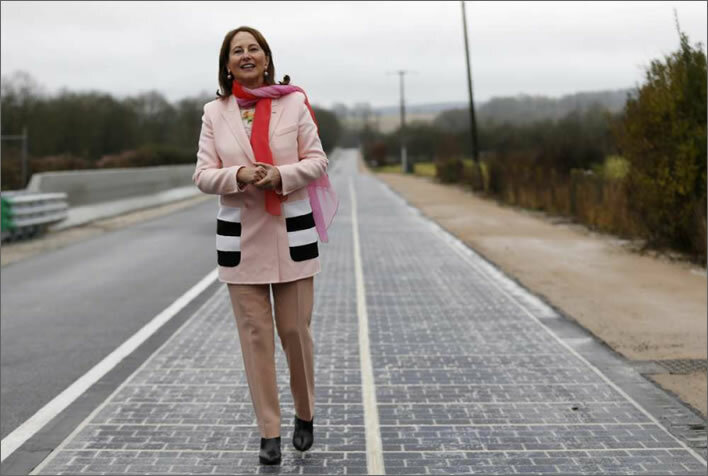 But if the employee told the CEO that the company will be paid 5 million EUR by the taxpayer for this solar road surface a bonus would definitely be on the cards. The solar panel surface has indeed been built, at a cost of 5 million EUR, that is 1,800 EUR a metre. This is only 15 times the cost of a comparable and still useless conventional solar installation that could have been built in the field at the side of the road. Ségolène Royal, the Environment Minister – you remember, Hollande's bit on the side – is here walking on it in her steel-tipped heels to show us how tough it is. The day of the opening ceremony was damp and overcast. Surely not! In Normandy? This degree of lunacy is difficult to describe without descending into apoplectic ranting. Unfortunately for us both, author and reader, countering this bunkum requires the use of dogged detail. I will completely understand if you make an excuse and leave now, otherwise, on we go. Solar power – certainly in the northern hemisphere in those places where power is needed – is worse than useless, in whatever form it comes. Serious, scientific calculations have shown that it is not possible to construct and deploy a solar system in the civilised latitudes without consuming more energy than it will ever produce. So, really, we should stop there and dismiss this road surface project out of hand. Unfortunately, this never happens. But even some normally green commentators are having to supress their embarrassment at the crackpot Project Wattway. Ideally, solar panels need to be positioned at right angles to the incoming radiation, that is, the sun's elevation and azimuth position, which changes during the day and during the seasons. If you want to avoid paying the enormous costs to move them around like sunflowers you have to align them in some optimised, least-worst direction. If you lay the receptors flat on the ground, they will only point sort of directly at the sun for an hour or so during a few days in June. In other words, flat panels are appreciably less efficient than static tilted panels, which in turn are appreciably less efficient than the unpayable dynamic tracking panels. Out of a 24-hour period, insolation is adequate only during a period of 2 to 4 hours around midday, depending on the season. Put another way, the panels only produce 'useful' amounts of electricity between 10:00 and 14:00 in summer and 11:00 and 13:00 in winter. Not only are the road panels flat on the ground, they are covered with a thick protective transparent surface. It is claimed that this has a negligible effect on light transmission, a claim which seems to defy the laws of optics. Further suspension of disbelief is required when we learn that the top layer of the plastic is roughened to produce a non-slip surface, which also is alleged not to impair light transmission. If this is so, then the French have invented a remarkable material that transmits light at all angles of incidence. When the tiny depressions are filled with rainwater the optical properties of this amazing material will be even more revolutionary. The reflection from the surface shows us that the laws of optics are still valid for rough, reflective surfaces. Phew! Look at that shine and repeat after me: 'A visible photon is a wasted photon'. Road surfaces are dirty – quelle surprise! They are smeared with oil residues and covered with dust from brake pads, rubber from tyres and particulates from exhausts. We could make a long list of all the interesting things that are found squashed on roads, especially in France. It is difficult to imagine that the small depressions in the rough surface will not fill up with the same residues that we see on all other roads. In winter, just when we need the power, the solar panels will be covered with snow or slush, in autumn with leaves, in summer with pollen. The year round the sky will have clouds, there will be mist and fog. 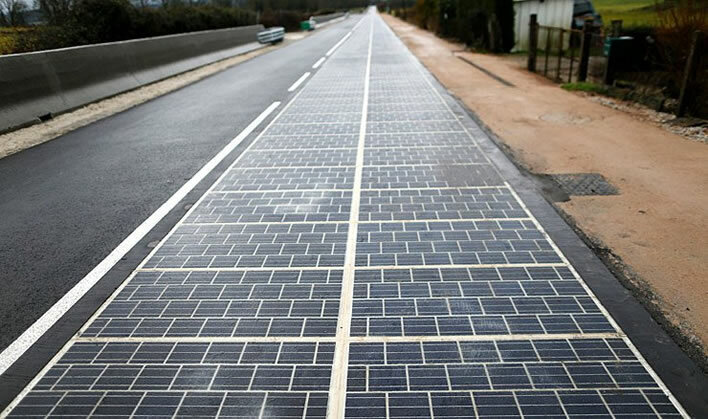 It is a triumph of hope over rational expectations that this prototype solar road has been installed in one of the gloomiest parts of France: 44 days of strong sunshine compared to 170 in Marseilles, as even the Guardian admits. Over the years the frost will perform its silent ministry. Let's see what happens. Even the most optimistic life-expectancies of solar panels standing around in fields don't extend beyond 30 or so years. It is difficult to see how panels on road surfaces will last longer than a small fraction of that. We shall also have to wait and see how much will need to be paid out in damages for accidents caused by black ice on these panels. A normal road has substantial thermal inertia, but the stretch with panels, worse than any bridge, will be always be at chilly, ambient temperatures. For its first test, the Wattway system was used in a company car-park. This seems an odd place to put solar panels, since at the height of the day they will presumably be relaxing in the shade under the parked vehicles, only getting a clear view of the sky when there is little or no sun to be seen. More reflections from the road surface, even in overcast conditions. It will be interesting to find out what happens with oncoming headlights or low sun. The clean part of the road seems to mirror the clouds, the filthy part next to the manhole cover mirrors France. More shininess during construction. Would you really want to drive on that, let alone ride a bike? If we only take what the lunatics themselves say about this project, we have to shake our heads in wonder that this idea was ever taken up. You just have to mention the word 'solar' or 'renewable' and susceptible people lose all contact with reality. We are told that the 'expected' annual production of electricity from this kilometre of road will be 290 MWh, that is nearly 790 kWh per day, followed by the obligatory take-away line for the green idiots: the 1 km of the solar road will be sufficient to power the public lighting of a village of 5,000 inhabitants. Ah, the trusty old trick of arguing from the capacity (full sun at 90° incidence) and not the actual output. The soft-brained, green-tainted media scribble it down and pass it out among the faithful. The last thing that this solar road can power is public lighting. When we have stopped laughing, it really doesn't take much intellectual effort to realise that this power is only delivered for an hour or two at midday in mid-June with a cloudless sky. When it gets dark and we turn the public lighting on, the power is not there for us. In winter the situation is much, much worse: our lights will need to be on for 12 hours or more, just the season when we get five minutes of glimmer from our road panels – if we are lucky. Please don't say 'batteries'. Oh, I forgot, silly me! What power is generated trickles into the EdF grid. When dusk falls and the street lamps go on we have nuclear power stations for that, thank goodness. France has more than a million kilometres of roads […] As part of the energy transition it is time to transform the road, today a simple ribbon of bitumen, to a source of energy. Interesting to see that from a driver's point of view, the road is now a three lane highway. So in her mind she has converted half a kilometre of rural, scarcely used 'bitumen ribbon' (only the one side for 1 km, don't forget) for 5 million EUR. She is now dreaming of doing one side of more than a million kilometres at a cost of – scribble, scribble…5 trillion EUR (five followed by 12 noughts). Even if the price halves, that is still quite an amount. Oh, and let's not forget that it will all have to be replaced every five? ten? years, so that is 5 trillion EUR every ten years, say. Just a minute: she now says that only one side(?) of one kilometre in every thousand will be turned into a 'solar road', meaning it will be a much more reasonable 5 billion EUR. We've then only got to wire it all up somehow and flog the trickle of power to EdF at a government rigged price, zut alors! 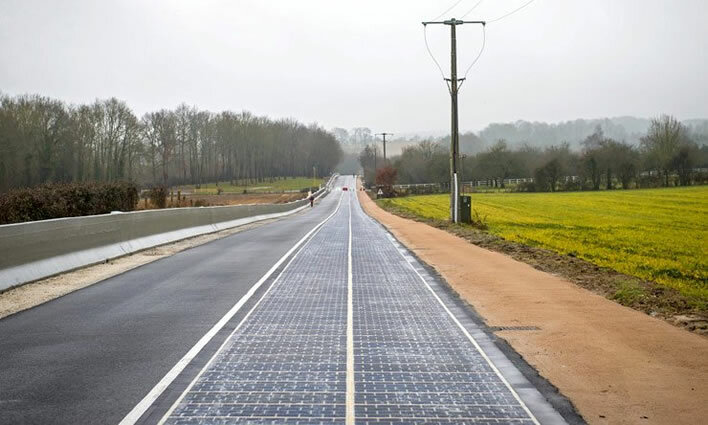 The Ministry of the Environment is already planning more 'solar roads' at several other sites in France. Why wait for the results from the test site? 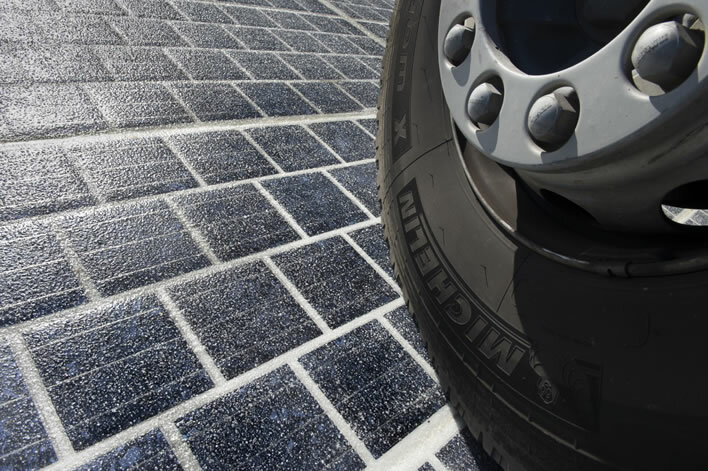 We discuss the report on the first year of the operation of the solar road here. The report is a triumph of Panglossian optimism over hard economic and technical reality – the scepticism in this 2016 article was not misplaced.